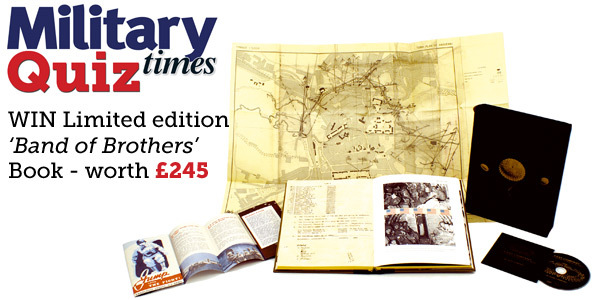 Complete the Military Times Quiz to be in with a chance of winning rare limited edition pack: EASY COMPANY, 506th Parachute Infantry Regiment – In Photographs, worth £245. The men that comprised Easy Company will forever be remembered for their audacious acts of bravery throughout World War II. Now, for the first time, through an archive of over 400 rare photographs and items of memorabilia – including maps, rosters and diary extracts – together with a 20,000-word original text from surviving company veterans, Genesis Publications presents the complete history of Easy Company, 506th Parachute Infantry Regiment, 101st Airborne. As well as the book, the pack includes the DVD, ‘In Good Company’ and facsimile maps and leaflets. The story is told by the men who were there, with contributions from Tom Hanks, Steven Spielberg, Damian Lewis, James Madio, and Jake Powers. Military Times readers will have the the exclusive opportunity to purchase Easy Company: In Photographs at a specially discounted rate. Orders will be fulfilled with free shipping which equates to a saving of £15 on UK orders; £25 on EU orders; £35 on US/Canada orders; and £50 RoW. Genesis delivers books to 50 countries worldwide using express delivery via a fully insured, international courier.